A smile is one of the simplest gestures that we can make, but it can also be one of the biggest. A bright smile is considered a reflection of friendliness, honestly, happiness and health. An attractive smile can be beneficial in social situations, help attract a partner and also make you more confident and outgoing. We are bombarded with pictures of celebrities flashing mega-watt grins, which unfortunatelymakes many people feel self-conscious about their own smile. These people often try and smile without showing their teeth which can look unnatural and forced. The enamel covering the teeth can become stained over time for a number of reasons, and as such, teeth whitening is considered to be one of the easiest and most economical ways of enhancing the appeal of your smile. White teeth are universally considered more youthful largely due to the fact that infant/first teeth are almost always whiter than their adult counterparts. Smoking – one of the biggest contributors to yellowed teeth! Genetics – the thickness of the enamel covering your teeth is usually determined by genetics. Thinner enamel can often show the color of the dentin beneath it, giving the tooth a darker appearance. Can’t I just use an over-the-counter teeth whitener? There are dozens of products on the market that claim to be able to improve the whiteness of your smile without the need for you to visit your dentist. However over the counter products are simply not able to provide the same strength of whitening as professional-grade treatments that your dentist is able to offer.Not only are the results usually only mediocre, but they also fade quicker and as such require regular treatments. 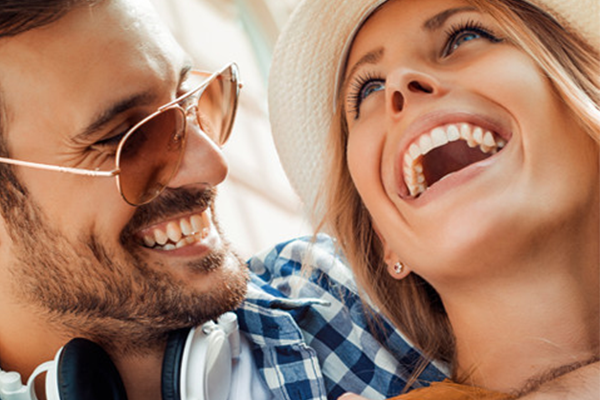 We highly recommend that you have the first treatment at the very least performed by a dentist who is qualified in providing successful teeth whitening procedures. Dental whitening is a painless procedure, but one that may require several visits to your dentist in order to achieve the final color that you are aiming for. During your consultation visit your dentist will likely photograph your teeth to provide a starting point for comparison so that he/she can effectively monitor the progress of your treatment. Your dentist will perform a thorough examination to ensure that no other treatment is required ahead of the whitening process, and may ask you a number of questions to get to the cause of the discoloration. Next your dentist or dental hygienist will give your teeth a thorough clean to remove any residue or bacteria that may prevent the whitening process from working properly. After this, it is time for the whitening to begin. There are two main types of tooth whitening performed. The most common variety, vital whitening, is able to be performed on teeth with current active nerves and involves whitening the tooth purely on the outside. The whitening product is usually a gel which contains a form of hydrogen peroxide and is applied directly on to the surface of the tooth. Your dentist will then shine a special laser or light onto your teeth, creating a chemical reaction that begins the bleaching. You can expect vital whitening to take between 30 and 90 minutes and depending on the extent of your staining/the level of whiteness you wish to achieve, you may require between one and three visits to your dentist’s office. Non-vital whitening is most commonly used in teeth that are stained from the inside out, usually as a result of damage to the interior nerves. In non-vital whitening your dentist will place the whitening agent inside the tooth and cover it with a temporary filling. Again, you may require multiple treatments in order to achieve the extent of whitening that you desire. Teeth whitening is actually a very safe procedure and is highly unlikely to cause serious side effects. However, you may find that your gums and teeth are a little more sensitive for a short time after the procedure. Not enough is known about the effect of teeth whitening on unborn babies and as such, pregnant women should refrain from having their teeth whitened until after delivery. Unfortunately, teeth whitening is not a one-off procedure. However, the speed with which the whiteness will fade will vary depending on a range of factors including whether or not you smoke and if you consume a lot of stain-causing foods and drinks. If you participate in these activities, you could see the whiteness beginning to fade as quickly as six weeks after your procedure. If you avoid stain-inducing activities and maintain a rigorous oral care regime, then you may not require another teeth whitening procedure for between six and twelve months after your initial treatment.